What are Diamond Certificates ? A baby’s birth is a special event. Commemorate this festive occasion with a brilliant diamond surely to be treasured for years to come. Diamonds can be saved as an investment or set in a jewel immediately or for later years. Baby Diamonds for christening, Infant baptisms, child naming and all ceremonies celebrating the birth and life of newborn babies. You set the budget. 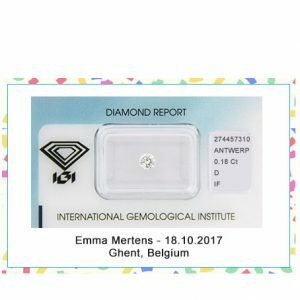 All diamonds are high quality with prices starting at 120 euro. Higher value diamond makes a perfect group or family gift. The Diamond comes in an attractive gift package with personalization of baby’s name and date of birth. Diamonds are available in all price ranges and are certified. You can also select any diamond from our loose diamond collection and ask it to be packaged in gift package or select from the list below.